1. The program kicks off with a gathering of all interns and orientation which occurs in the second half of spring semester. Population: The intern will decide with whom they would like to stand in solidarity for the summer. Past populations have included children and youth, people with disabilities, individuals experiencing homelessness, older adults, people with mental illness, the incarcerated, immigrants, survivors of domestic abuse, and more. Location: Students can elect to serve and live here in Portland, in their hometown, elsewhere in the United States, or in another country. Please note that the Moreau Center will not be subsidizing the cost necessary to travel to a service location. Service: Students have served with social service agencies, community-based organizations, non-governmental organizations (NGOs), prisons, hospitals, Catholic Worker Houses of Hospitality, faith based non-profits, and post-grad service sites. Students will be directly working with people. 3. Students commit to serving 300 hours (approximately 8-10 weeks) over the summer months. Your start date will depend on the timeline decided upon with your specific service site. You will be asked to indicate on your application when you are available to serve. If you are considering taking summer classes and participating as an Intern for Justice, Portland placements allow students to participate in a summer course. However, it is important to consider your ability to balance coursework with being fully present to the needs of the community and agency in which you are serving. If you are not serving in Portland, depending on your start date, you may be able to participate in the first summer session. 5. The Interns for Justice experience will conclude with a reintegration seminar in the first half of the fall semester. IFJ Outreach dinner January 24th 5-6:30pm. Applications are available February 1 - March 1, 2019. Click here to apply! To view reflections from previous Interns for Justice, visit our blog. Immerse yourself in a L'Arche community in Bologna, Italy, for eight weeks beginning just after Spring semester. This program will run from approximately mid-May to mid-July. L’Arche is an international community of adults with and without disabilities living together. It was founded 50 years ago in France by Jean Vanier as an ecumenical and inter-religious community with roots in Catholic tradition. Young volunteers from around the world choose to live and serve in L'Arche communities for a period of time to learn the "art of presence" and the beauty of friendship with adults with disabilities through community life. Students may prepare meals, help the residents to take care of themselves, coordinate activities for residents, and participate in community formation, among other duties. The city of Bologna is one of 10 official "sister cities" to Portland. Through the Bologna-Portland Association, students will also have an opportunity to learn about and discover their sister city in Italy. Italian language is not required, but applicants are strongly encouraged to enroll in a beginner's Italian language course. Familiarity with Spanish or French is also useful. Accommodations and food are provided in the L'Arche community; however, students are responsible for airfare and any other expenses. 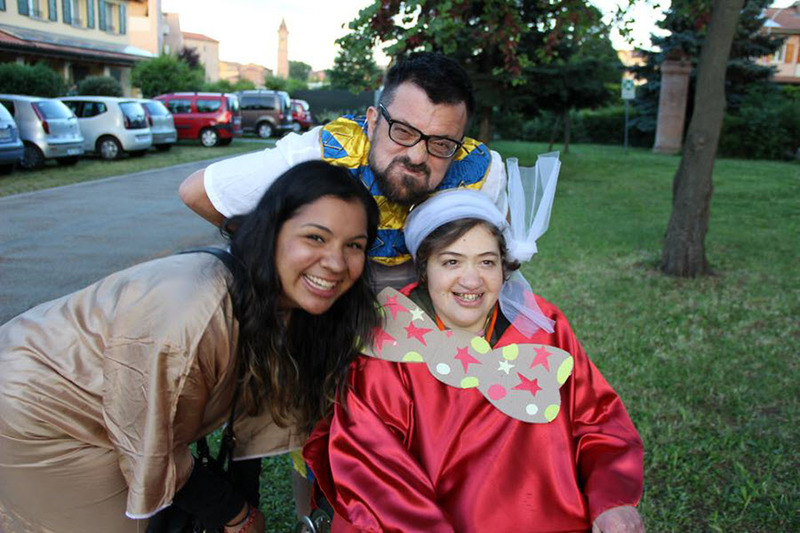 To view student reflections from past L'Arche Bologna experiences, visit our blog. To apply, complete the application linked here!